Steve is becoming increasingly well established as an artist and tutor in art, and is based in the North-West of England. She attends courses and master classes given by other artists, as well as giving classes and workshops in the Chester area. She primarily works in oils, but she is accomplished in watercolours, pastels, acrylics and gouache. She also accepts commissions. This large canvas was inspired by Holbein's "The Ambassadors". 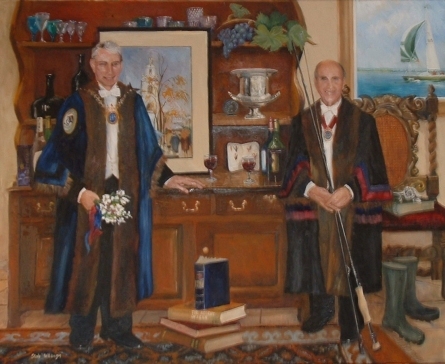 It depicts two senior officers of the Worshipful Company of Glass Sellers of the City of London - http://www.glass-sellers.co.uk/ - surrounded by items referring to their interests, enthusiasms and careers. It was presented to the Livery on May 8, 2005, following the Summer Service at St James Garlickhythe. A copy of Steve's booklet about the development of the painting is now in the Livery archives, and the picture itself is now owned by Past Master Martin Everett. No images on the internet can do justice to the real thing, in which the glasses look transparent, the books look solid, and the wine looks drinkable. Steve is Rachel Wright 's mother - don't ask why she's called "Steve"!